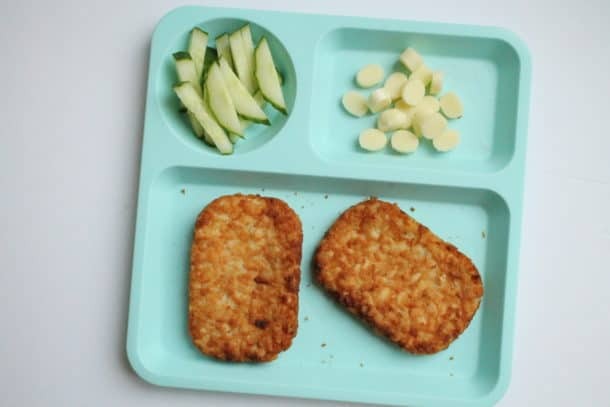 Cooking with your kid is a great way to get them interested in eating their meal and introducing new foods. 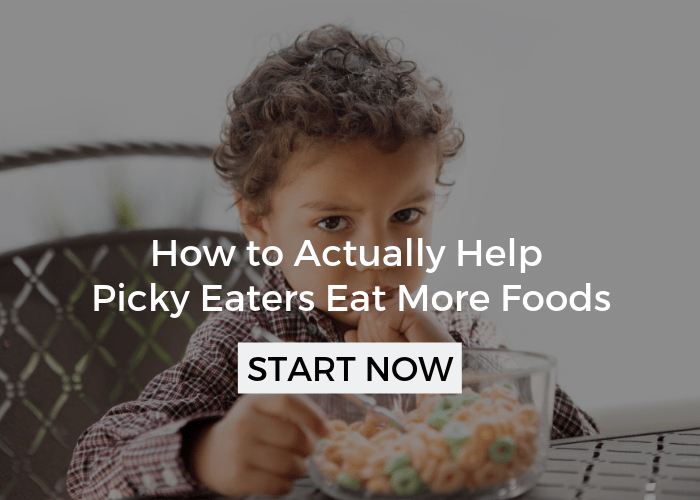 When we give our kids something new to eat it often just shows up on their plate, looking totally foreign. They don’t know where it came from, what it is going to feel like, smell like, or taste like. Some children are adventurous and just dig in, but many are tentative and are just too unsure to give it a go. When your kid helps you prepare the meal, they get to see where it comes from, what is smells like, and might even get to taste and feel it too. These interactions can really help set the stage for a successful meal because they are often interested and have invested something in it. If you are Type A, like me, heed this warning: it may be very messy. They may mess something up. And that is okay! Mentally prepare yourself for this going in and try to let go of the control of having it be perfect. I have to remind myself of this everytime I cook with Sam! 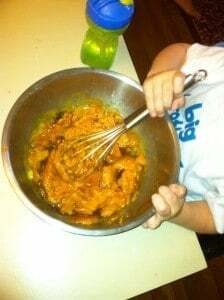 Sam mixing the pumpkin waffles. He does a pretty good job for a 2 year old! 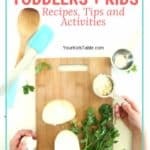 If you aren’t comfortable in the kitchen, there are many fool-proof recipes you can get your kids involved in (see pancakes below). For that matter it doesn’t even have to be a recipe, they could help you assemble a tossed salad or make scrambled eggs. The idea is just to get them involved, be part of the process, interacting with the food! 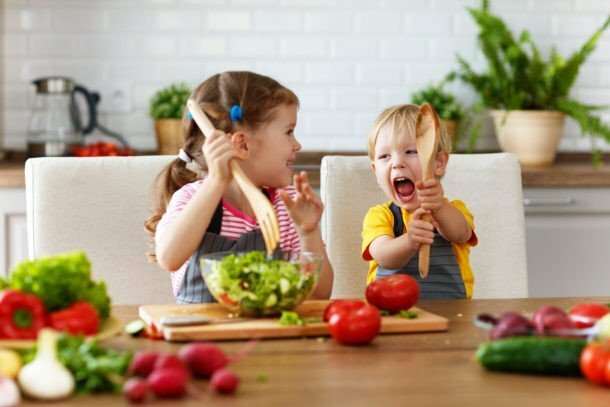 Cooking with your kid offers countless benefits as well, such as bonding time with you, and teaching learning concepts such as following directions, measuring, and fractions. 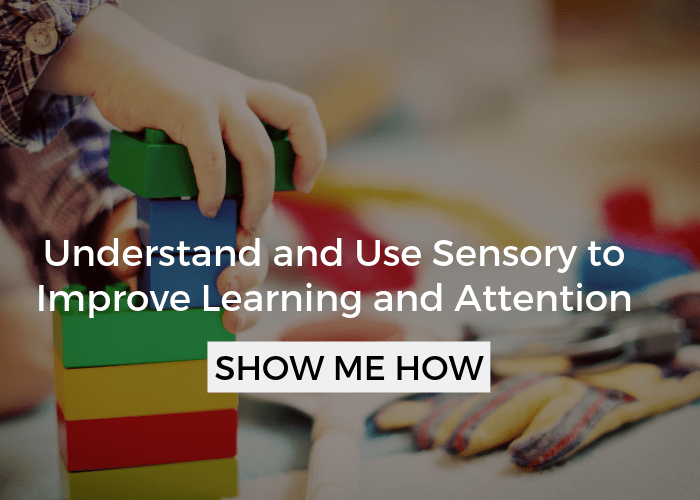 Your kid will also learn the value of being helpful and that their help is appreciated, which will increase their self-esteem and sense of self-worth! Most weekends Sam cooks pancakes or waffles with his Dad. 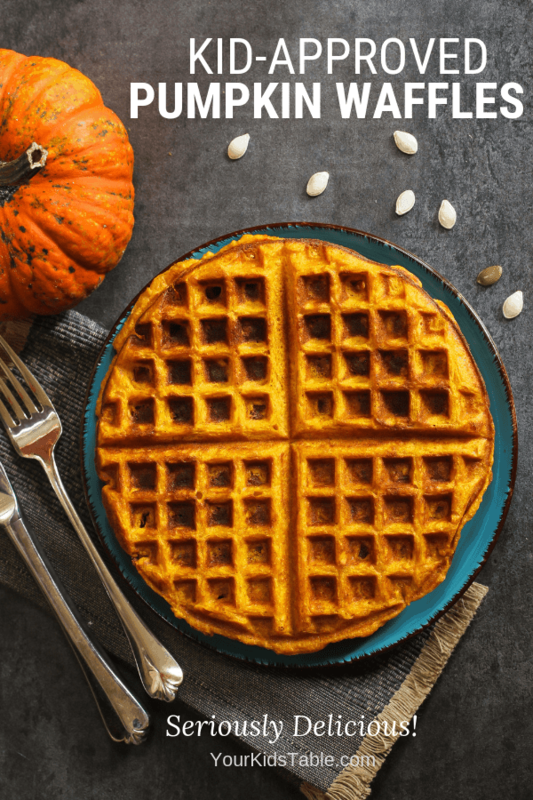 I like these pumpkin versions because they increase the nutritional value and are a different color and texture from the regular pancakes/waffles. Both versions are a little denser and more moist. They are sooooo good, even if you aren’t a big pumpkin fan. I like to top these with sliced bananas and maple syrup! Mix together flour, baking powder, baking soda, cinnamon, nutmeg, ginger, and salt in large bowl. In a second bowl, add eggs, sugar, pumpkin, milk, and butter; beat well. I do these in my belgian waffle iron and it uses about 1 cup batter and takes 4-5 minutes to bake. They come out a nice deep, golden brown. These are great with a little bit of syrup, but would also be great with honey butter. In a large bowl combine the flour, sugar, baking powder, and baking soda. Add egg, buttermilk, pumpkin, and melted butter; whisk to combine. Heat a nonstick skillet over medium-high heat. Add 1 teaspoon unsalted butter; swirl pan to coat. Spoon heaping tablespoons of batter 2 inches apart into skillet. Cook for 1 to 2 minutes or until pancakes have bubbles on top and are slightly dry around edges; turn. Cook until golden on bottom, about 1 minute more. If pancakes brown too quickly, reduce heat to medium. Repeat with remaining batter and unsalted butter. Serve warm with syrup and raspberries. 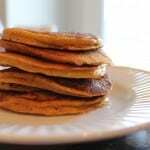 Mix 1 cup buttermilk pancake mix, 2/3 cup lowfat milk, and 1/3 cup canned pumpkin. Makes 8 3-inch pancakes. Tip: Pumpkin is often only available in large cans and you may only need 1/3 of a cup, depending on the recipe. I take the leftover pumpkin and freeze it in 1/3 cup increments for future use. The waffles and pancakes freeze great so think about doubling your recipe. They pull apart easily from the freezer and you can pop them right into the toaster frozen, and no one will be the wiser! 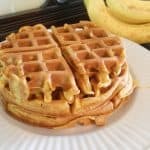 The consistency of these waffles are a great starter food for babies transitioning to table foods, as well. You can also give them to babies frozen, it will slowly defrost as they are eating and it will feel great on their gums. 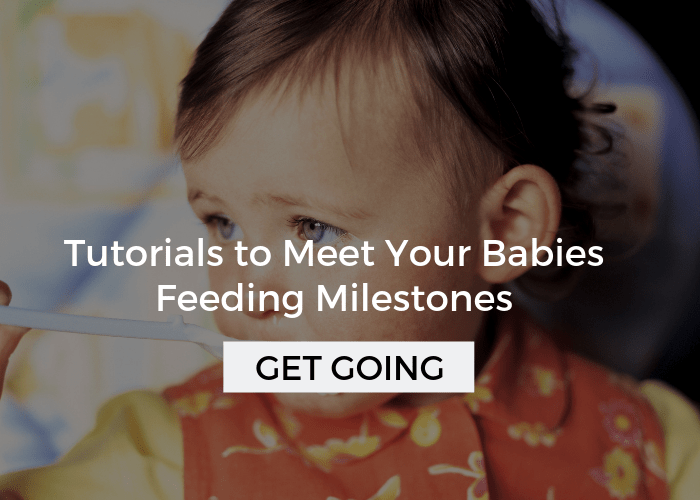 Just make sure they are chewing their foods and feeding themselves with their fingers before you try this (usually around 7-9 months, although it may be later). 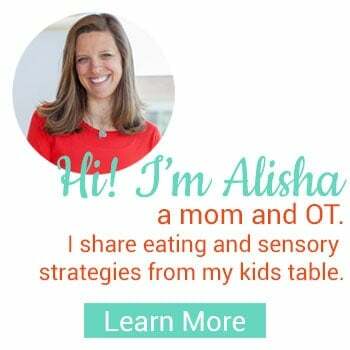 If you are looking for more inspiration, follow me on Pinterest, I have lots of yummy recipes pinned your kids will enjoy. 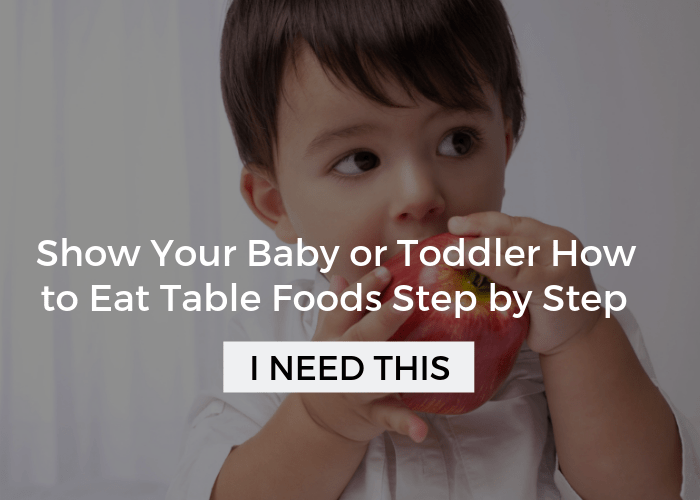 What age would you say is a good time to start cooking with your kid? Mine is nearly 18 months which seems a big young. Karin- usually by 2.5 they are able to help out without a ton of redirection, but at 18 months they can help with some tasks in cooking. Of course, this requires extra time and a lot of patience at this young of an age. Think helping stir or dump ingredients into the bowl! Thanks for this recipe! I’m looking for healthy things to feed my 9 mo. old who no longer wants purees and this sounds perfect. Will definitely be a great thing to make with her as she gets older too. They are great, you will both love them. We had the pancakes this morning. 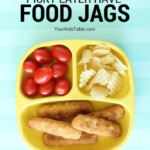 Make sure you check out my post, Mega List of Table Foods for Your Toddler, if you are looking for more ideas! These sound great, I am going to have to make these with Sam when I have have them sleep over. Do they have a strong pumpkin flavor?